Christmas Dresses From Want That Trend Review. When it comes to Christmas season, I am a big kid! I love everything about Christmas and the run-up to the big day. Last week I got the chance to review 2 matching Christmas dresses from Want That Trend for me and my Daughter. Matching dresses for me and mini-me, how lovely. Now how would we style them!? You may have seen Want That Trend on Facebook? I often see their Christmas range of Mum and Daughter dresses made to match. They also make matching Mum and Daughter shoes too. So sweet. We both love shoes here too and are now in the same size. Eek, I must watch that my shoes do not start disappearing! Even though there are 32 years between us, we often find we both love the same items of clothing. Especially if Christmas themed. I often find some of my clothes hidden away in my Daughter’s room. I think she hopes I forget about them. No chance!! I picked us these Santa’s Sleigh Christmas Swing dresses as I knew my Daughter would love this one too. My Daughter is a big Christmas fan too and I was excited keeping these dresses a secret so I could see the look on her face when they arrived. Also, if I had mentioned on Friday, we were getting some Christmas dresses she would have been asking everyday day if they were here yet. I guess she loved it too!! Want That Trend has an amazing selection of Christmas dress for you and matching dresses for the little ones. My little one is not that little anymore, however they cater for all sizes. I have been warned, not to wear it the same time as my Daughter and to let her have the option of wearing it first. Apparently, we can both wear them Christmas day though!! I had not ordered from Want That Trend before so I ordered size M/L. These dresses do come a lot bigger than I thought so I think a S/M would fit nicely next time. No worries though, my Daughter likes her’s floaty and I like mine with a belt. We both love these dresses. Santa’s Sleigh Christmas Swing from Want That Trend: £19.95 Each. 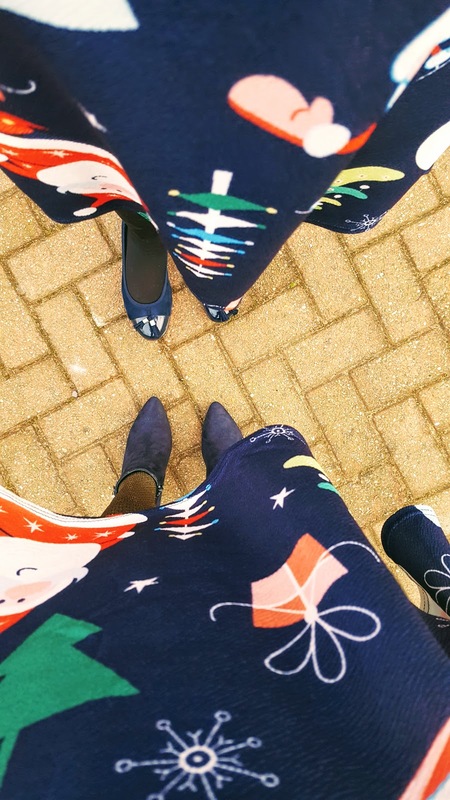 Do you love our Christmas dresses as much as we do? You can grab yourself a bargain. We got sent some Christmas dresses to review. All thoughts are my own and I was not paid for this post. Bring On The Party Season In Style: Christmas Fashion. Things I Love About The Festive Season – The Christmas Tag. Christmas Gifts For Her: Ideas And Christmas Gifts. Sportsdirect .com £5 Christmas Challenge. "Bruschettas With Mushrooms, Sweet And Sour Apple Sauce And Parma Ham"
These are so festive and the Christmas print is so fun for the holidays. I love matching Mommy+Me posts too and you ladies look spectacular. Love your shoes and hosiery too, Claire. Your daughter is beautiful and so tall!Come join my linkup. It is LIVE, welcome by every Thursday!! Thanks Ada 🙂 we love these dresses. Awww how pretty! I love this! You two look gorgeous! I love cute prints and yours is so festive. Perfect for the holiday.. I'm not a great lover of Christmas! But I ADORE these!!!!! This is a fun idea for Christmas day! I love this! The pair of you look really cute together! Nice to see your beautiful daughter in a post like this! Ooh these are fab, I keep thinking about bagging a christmas dress this year, love these. The dresses look great. Love the style. Good to see you in your mother-daughter twinning outfits! I look forward on this too when I became a mom! So excited to have my outfit of the days too. You both look fab! I love the lead up to Christmas! This is AWESOME!!!! I loved the print y'all chose as well! So cute.I would love for you to join our linkup on Monday!